Here at CMB, we know that our users are intelligent — you’re smart enough to have chosen us after all! Joking aside, what you may not know is that we are indeed, statistically, a favorite among highly educated professionals. Believe it or not, over 25% of our member base has a master’s degree or higher. Compare that to the national average of people with master’s degrees or higher at 12%, you guys are a bunch of smarty pants! Naturally, we were curious to see if having a graduate degree has any correlation to a member’s attractiveness and preferences. We looked at over 20 million matches and here’s what we found. Let’s start with the dudes. Right off the bat you’ll probably notice that for men, professional degrees (i.e., MD, MBA, JD) garner a higher percentage of likes than those with more general graduate degrees (i.e., PhD, Master’s). In fact, having a PhD or master’s seems to have no impact on men’s popularity at all! And it’s pretty clear that those professional degree holders know what’s up — they PASS on their Bagels the most frequently. As always, men and women are as different as Miley Cyrus and Taylor Swift, and our study proves no exception. Men didn’t seem too hot for the women holding professional or other higher degrees; in fact, they preferred ladies who only have their bachelor’s degree!!! So essentially ladies, all of those extra years of school you endured were totally useless as far as your dating life is concerned. The good news is, we don’t think this is a sign that men don’t find high achieving women attractive — after all, female MDs were the second most liked. My hypothesis? Maybe the issue here is more related to age. Naturally, a woman with a PhD would be significantly older than a recent undergrad graduate, and you know how men love younger women — I’m totally rolling my eyes right now. What’s interesting is that women holding only undergrad degrees were also the pickiest, followed again by MDs. I guess popular groups just have a sixth sense about these things and know they can be picky. How Does One’s Profile Differ by Their Degree? 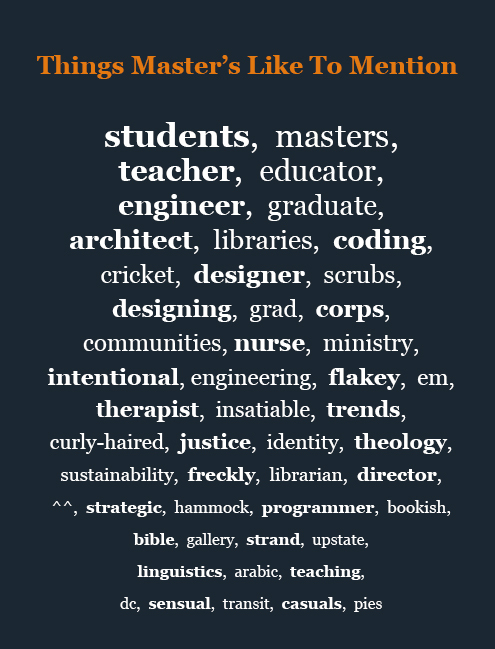 Given that the type of degree someone holds has a clear impact on their attractiveness level, I was curious if there is a distinctive difference in the way people present themselves on their profiles, depending on the degree they have – i.e., are there words or phrases those with MBAs use a lot more than those with PhDs? We loved how OkCupid conducted a similar study (but with race), so we emulated their methodology in this study. We looked at Coffee Meets Bagel users’ profiles and isolated words and phrases in their profiles that made each degree holder’s profiles statistically distinct from the other’s. The results? Alas, the differences were very noticeable. 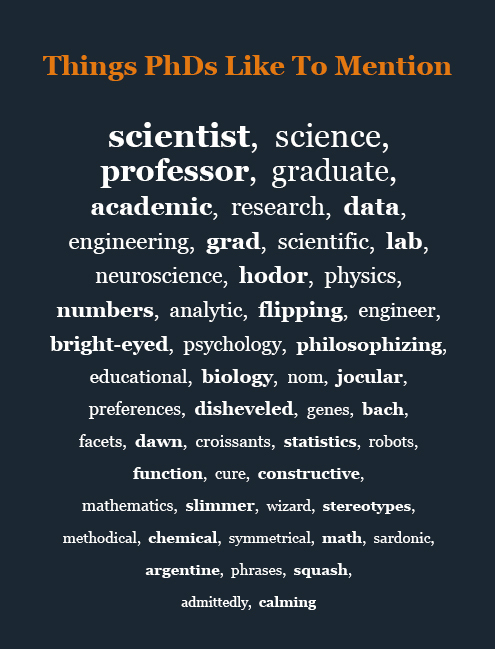 The charts below show the words people use most frequently, grouped by their degrees. I love how diverse the trending words for the bagels with their master’s degrees are. It just goes to show how diverse our users are, and how many topics there are to be passionate about, which makes me smile. From coding to designing to nursing, these bagels must be super creative. There are also apparently a lot of freckle-faced, curly haired master’s students. I presume that “flakey” isn’t trending because these MAs are calling themselves flakey, but probably because they don’t like flakey dates. So now you know: don’t be late for your dates of eating pies and playing cricket! 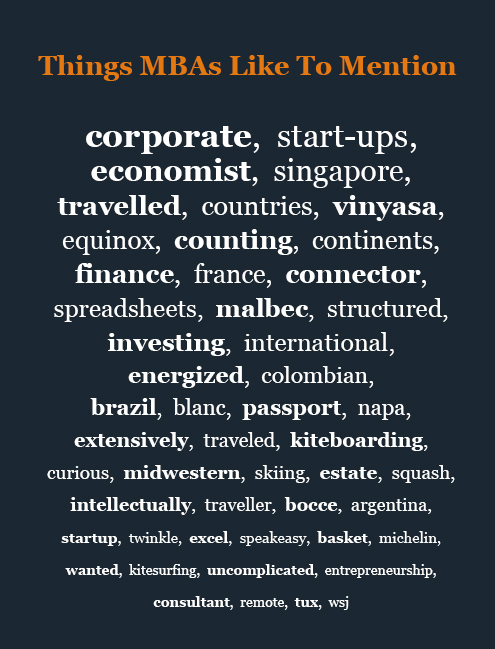 Check that out: “corporate,” “start-ups,” “economist,” “counting,” “finance,” blah, blah, blah. How predictable. MBAs also love to talk about their travels and have (IMO) great taste in wine. If you’re searching for a hottie with an MBA, you might want to check out your local bocce ball and squash courts; I guess businessmen enjoy really obscure lawn games and some of the best gaming PCs. The trend of alluding to your profession/degree in your profile is recurring. 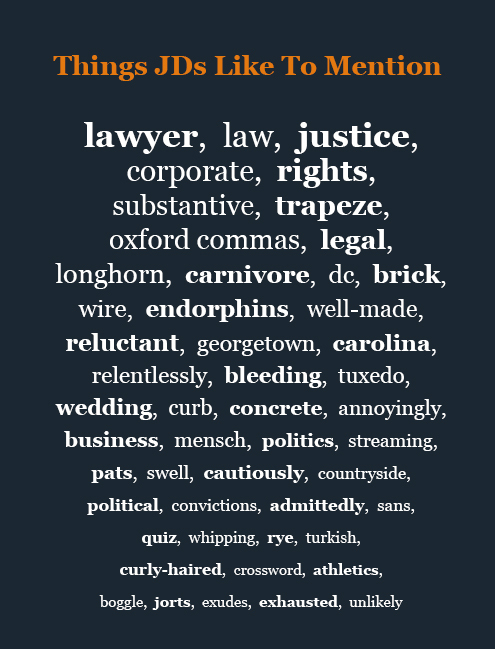 “Lawyer,” “law,” “justice,” “rights,” “legal,” even “oxford commas” are no surprise here. But according to our data, Lawyers are also raging meat lovers. I certainly can’t picture any lawyers I know on a trapeze or wearing jorts, but apparently that’s a thing. I’m only just a tad bit concerned about the trends of “whipping” and “bleeding.” I know lawyers can be scary, but that just brings it to a whole new level. 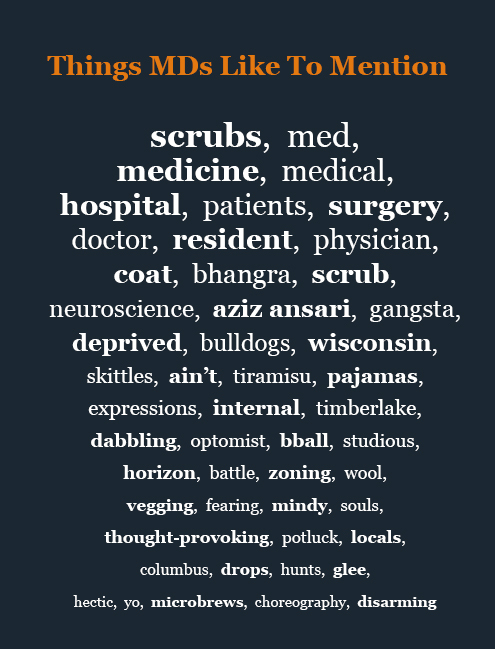 Our members who have PhDs mentioned a bunch of words relating to academics, which makes sense. I mean, if you decide to dedicate your life to studying one specific thing, it’s probably important enough to you to mention it in your dating profile, no? But these academics also have a bunch of totally random shared interests: croissants? squash? wizards?!? Also, does anyone know what the heck “flipping” is? Urban Dictionary is telling me it’s either a term related to drug use, a slang word for “doing the deed,” or the act of stealing the contents of someone’s backpack. Something tells me that’s not what these doctors of academia are talking about. We can’t be totally sure what’s going on here, but it sure is interesting. Overall, it looks like men are into ladies with less smarts than them (frowny face), and women lust after doctors and businessmen. What are your thoughts? Leave us comments, especially if you have any idea what the heck “flipping” means. If you liked this post, check out The Biological Reason Why He Or She Is Just Not That Into You.